A king of Shinar (Gen. xiv. 1, 9), who invaded the West in conjunction with Chedorlaomer, king of Elam, and others, and destroyed Sodom. The identity of the name has long been a subject of controversy among Assyriologists, and is not even yet established to the satisfaction of all scholars. Schrader was the first to suggest ("Cunciform Inscriptions and the Old Testament," ii. 299 et seq.) that Amraphel was Hammurabi, king of Babylon, the sixth king in the first dynasty of Babylon. This is now the prevailing view among both Assyriologists and Old Testament scholars. 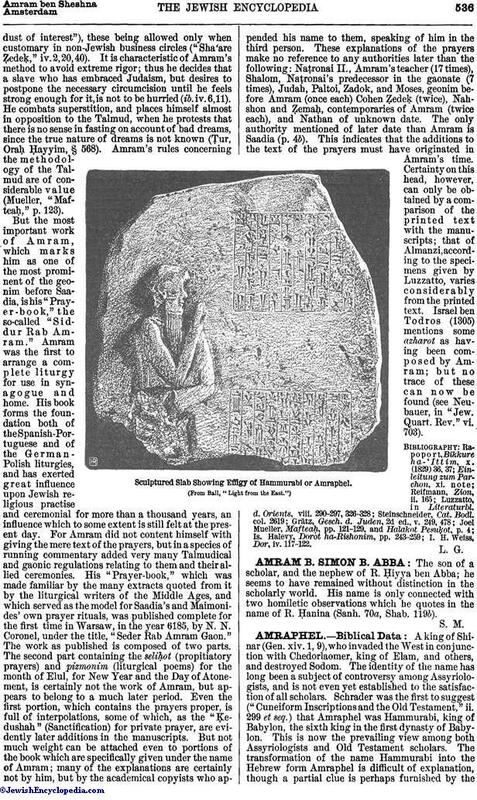 The transformation of the name Hammurabi into the Hebrew form Amraphel is difficult of explanation, though a partial clue is perhaps furnished by theexplanation of the name in a cuneiform letter as equivalent to Kimta-rapashtu (great people or family). On this basis "'am" = "Kimta" and "raphel" = "rapaltu" = "rapashtu." Hammurabi was the founder of the centralized kingdom of Babylonia, with the capital at the city of Babylon. 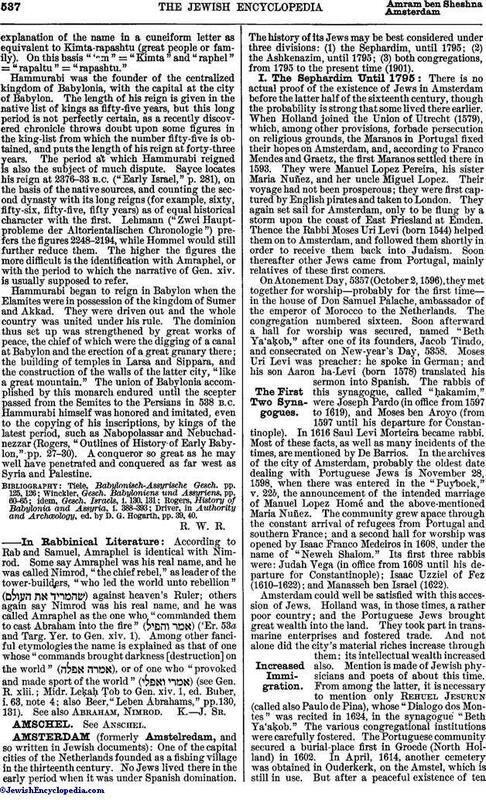 The length of his reign is given in the native list of kings as fifty-five years, but this long period is not perfectly certain, as a recently discovered chronicle throws doubt upon some figures in the king-list from which the number fifty-five is obtained, and puts the length of his reign at forty-three years. The period at which Hammurabi reigned is also the subject of much dispute. Sayce locates his reign at 2376-33 B.C. ("Early Israel," p. 281), on the basis of the native sources, and counting the second dynasty with its long reigns (for example, sixty, fifty-six, fifty-five, fifty years) as of equal historical character with the first. Lehmann ("Zwei Hauptprobleme der Altorientalischen Chronologie") prefers the figures 2248-2194, while Hommel would still further reduce them. The higher the figures the more difficult is the identification with Amraphel, or with the period to which the narrative of Gen. xiv. is usually supposed to refer. Hammurabi began to reign in Babylon when the Elamites were in possession of the kingdom of Sumer and Akkad. They were driven out and the whole country was united under his rule. The dominion thus set up was strengthened by great works of peace, the chief of which were the digging of a canal at Babylon and the erection of a great granary there; the building of temples in Larsa and Sippara, and the construction of the walls of the latter city, "like a great mountain." The union of Babylonia accomplished by this monarch endured until the scepter passed from the Semites to the Persians in 538 B.C. Hammurabi himself was honored and imitated, even to the copying of his inscriptions, by kings of the latest period, such as Nabopolassar and Nebuchadnezzar (Rogers, "Outlines of History of Early Babylon," pp. 27-30). A conqueror so great as he may well have penetrated and conquered as far west as Syria and Palestine. Driver, in Authority and Archœology, ed. by D. G. Hogarth, pp. 39, 40. According to Rab and Samuel, Amraphel is identical with Nimrod. Some say Amraphel was his real name, and he was called Nimrod, "the chief rebel," as leader of the tower-builders, "who led the world unto rebellion" ( ) against heaven's Ruler; others again say Nimrod was his real name, and he was called Amraphel as the one who "commanded them to cast Abraham into the fire" ( ) ('Er. 53a and Targ. Yer. to Gen. xiv. 1). Among other fanciful etymologies the name is explained as that of one whose "commands brought darkness [destruction] on the world" ( ), or of one who "provoked and made sport of the world" ( ) (see Gen. R. xlii. ; Midr. LeḳaḦ Ṭob to Gen. xiv. 1, ed. Buber, i. 63, note 4; also Beer, "Leben Abrahams," pp.130, 131). See also Abraham, Nimrod.